When the sun was finally shining again, I took advantage of the light and snapped some pictures of areas of our house that I have yet to share. 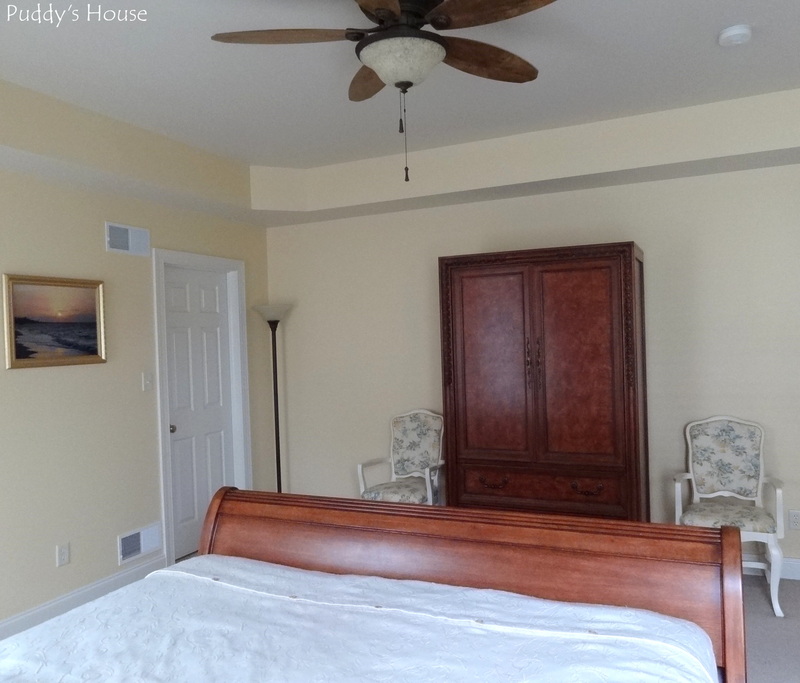 First up is our Master Bedroom and Bathroom. 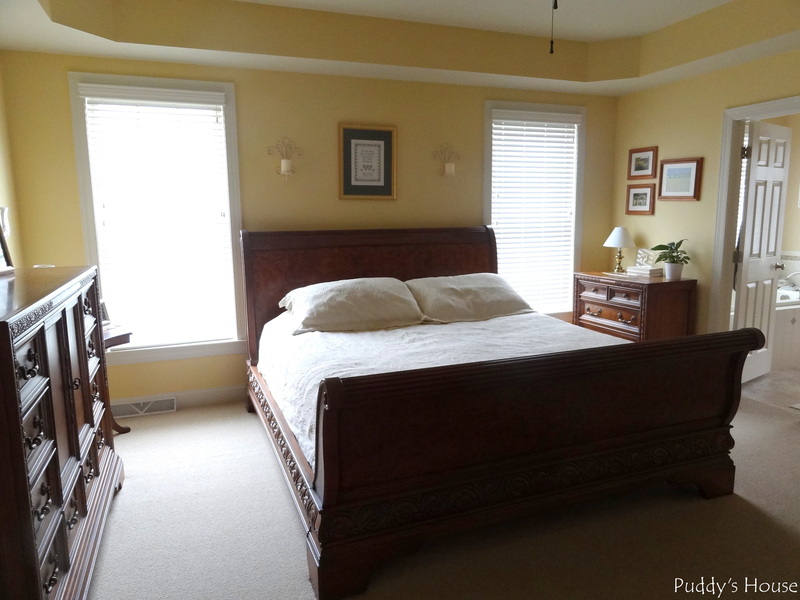 This was the first room in the house that we painted and I still love the nice yellow color that we chose. This is the view of the room when you enter from the hallway. The art above the bed is very special; my grandmother cross-stitched it for our wedding. I tried to take a close up and kept getting a glare, or my reflection in the picture. The candle sconces were a Goodwill find that I gave a quick coat of spray paint to freshen up the look. If you walk to the bed and turn around, this is the view of the dresser and Bob’s side table. It was definitely a bright shiny day! And, this is the view from our bed. The door on the left is to the closet, which I’m happy to say has stayed nice and organized since I revealed my new system here. You can see that the décor so far is very simple. It’s definitely still a work in progress, as is most of our home. The one picture you see is from the sunrise on one of our first trips to Mexico. The chairs are one project that I did in this room. 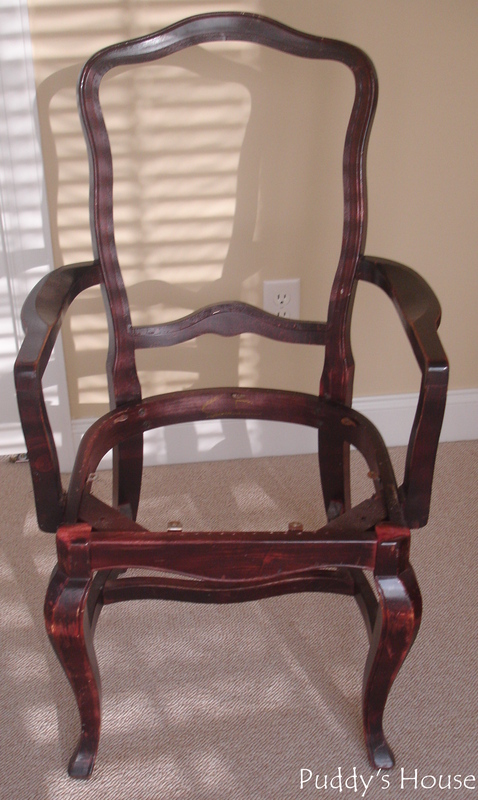 I found a listing on Craigslist a few years ago – it said wooden arm chairs $5 each, 30 available. It was a local restaurant that had replaced all of their dining room chairs. Bob went to check it out for me, and came home with 2 of the chairs. I didn’t think to take a picture before I removed all the fabric, but picture a dark blue fabric worn very well from years in the restaurant. I stripped the fabric and prepped the chairs for painting. 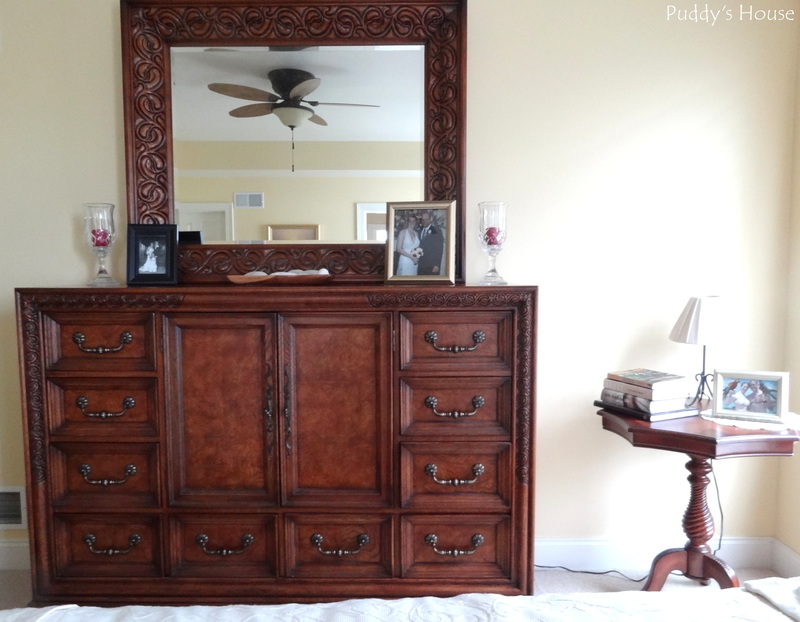 I used my favorite spray paint – Rustoleum Heirloom White. 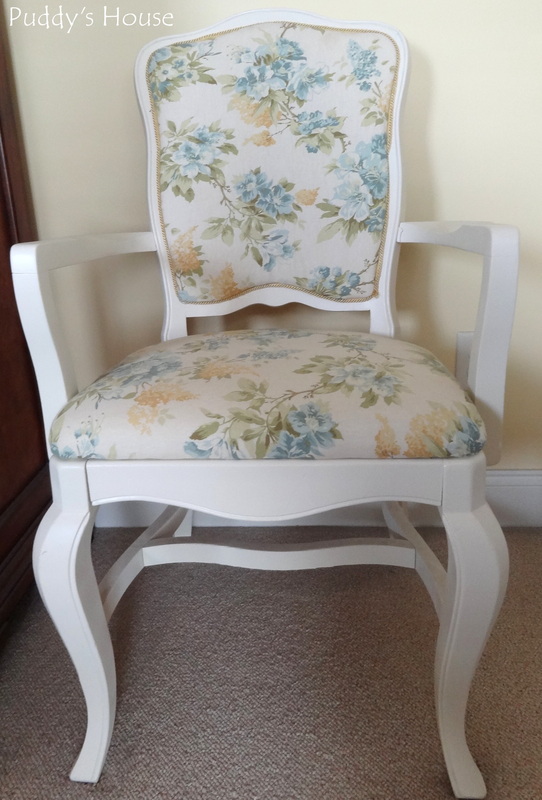 After painting, I reupholstered with new fabric and trim. It was a challenge since the backs were two-sided covered in fabric. I improvised a bit along the way, but am happy with the end results. They add some color to the room, while also lightening it up a bit with all the darker wood furniture. Now, back to the tour. The Master Bathroom is through the door right beside my nightstand. 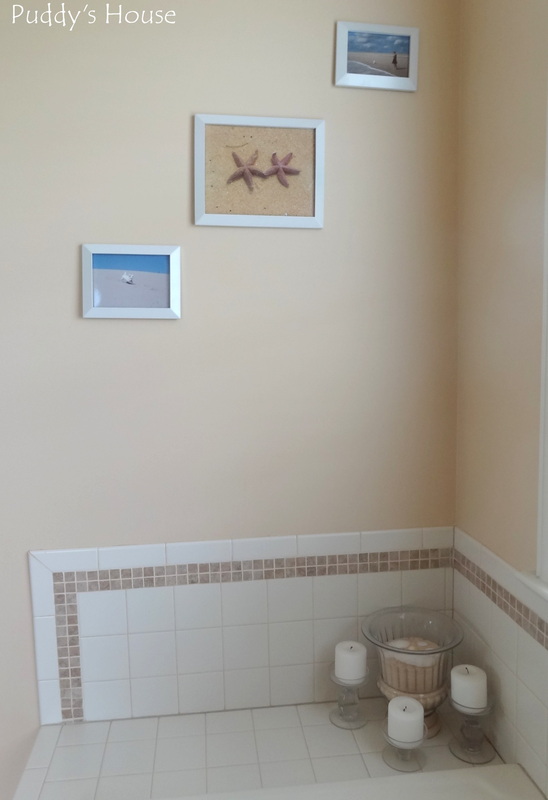 I have worked a bit more on decorating the bathroom with a beach theme of sand and shells décor. I have taken many liberties in this space, because it is not a space that Bob uses. We love the beach and have collected so many shells over the years. I’ve been able to use some of that collection in this bathroom. 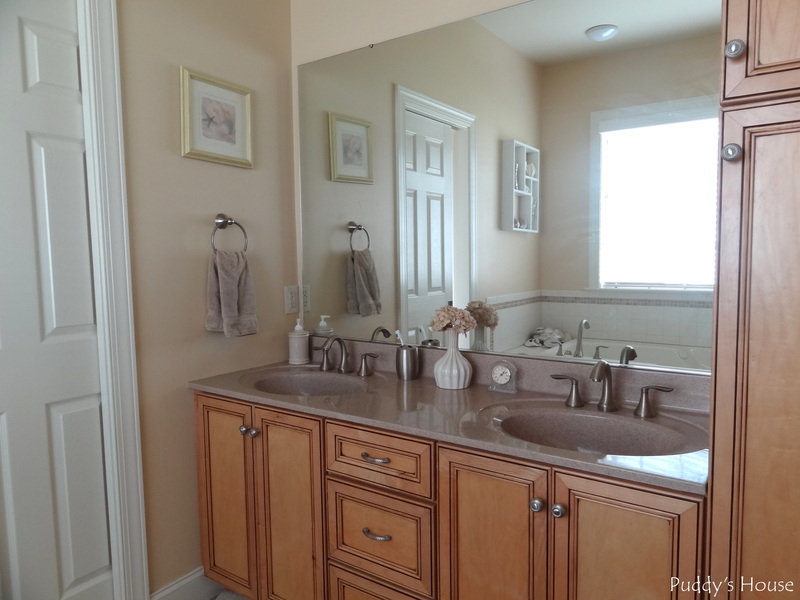 The double vanity is on the right as soon as you enter the door. I got the artwork at Goodwill for a few dollars, the vase at a local consignment store, and the clock at a yardsale (it is intended to help me stay on time when I’m getting ready for work). 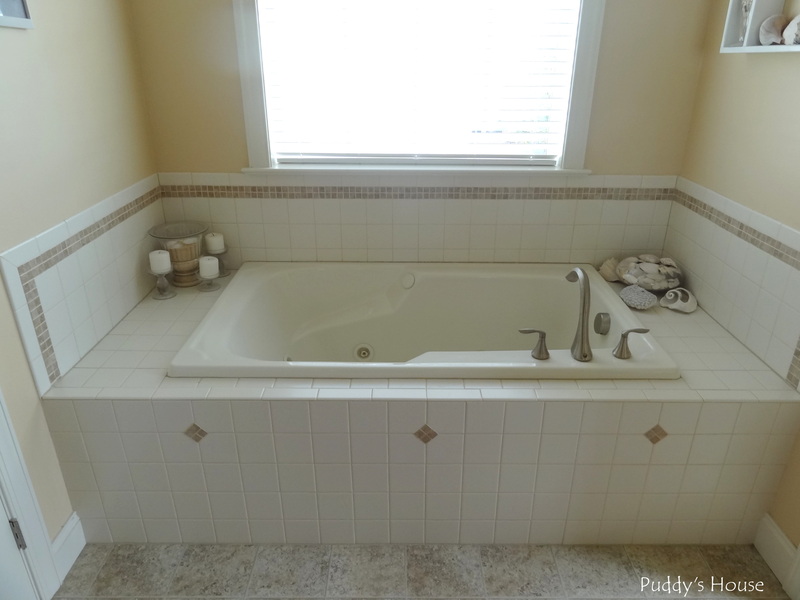 The whirlpool tub is on the left, parallel to the sinks. The shells are all ones that we have collected. The shelf is one from my childhood. I should have taken a before picture. It was a natural wood – very country style. It was originally flipped the other way with a door over the one section with a heart cut out of it. I removed the door, patched the holes, gave it a fresh coat of paint and flipped it on its end. The shelves are filled with a combination of collected and purchased items. The wall décor on the other side, features beach pictures that we have taken in frames that were given to me at my bridal shower. Puddy loves the beach, so its nice to see pictures of him enjoying it every day. The starfish were not harmed in the taking of this picture….I snapped the photo and released them back into the ocean. 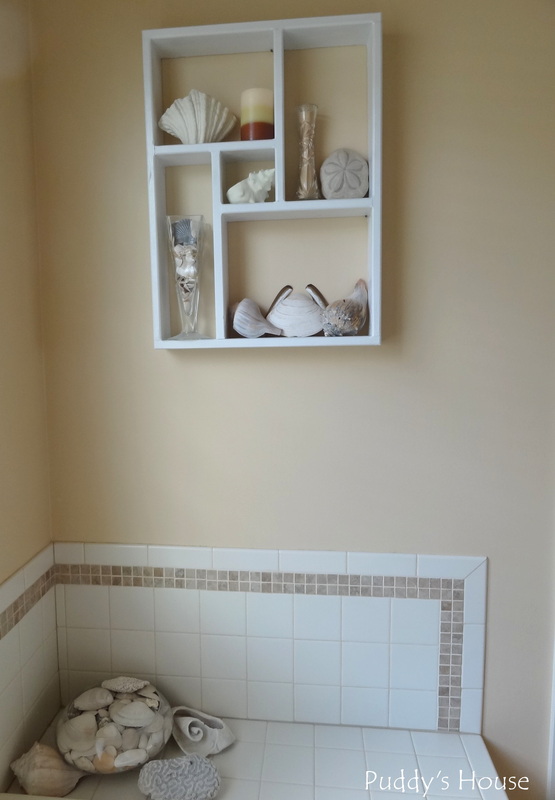 There is a pocket door that separates the sink and tub area of the bathroom from the toilet and shower area. 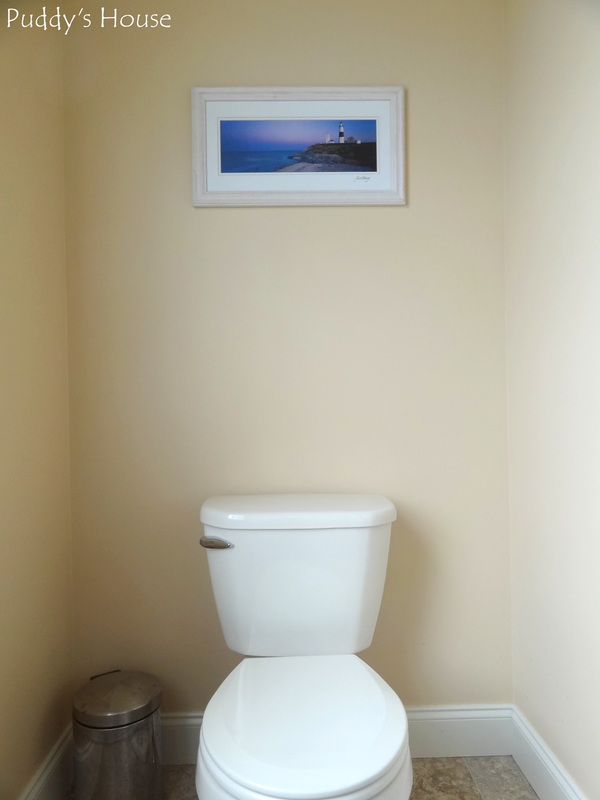 The toilet area features some yardsale art that I purchased. The shower area is not ready to share yet. It is just a shower stall and I have struggled to find a shower curtain that I like. I recently found a curtain I liked at a thrift shop, but of course it is for a regular tub/shower combination. I’m going to try to modify it to work for the shower stall. For the price, it was worth trying to make it work, especially since I like the material. Anyone else have a shower stall and struggle to find a curtain? What do you do with shells you collect at the beach? 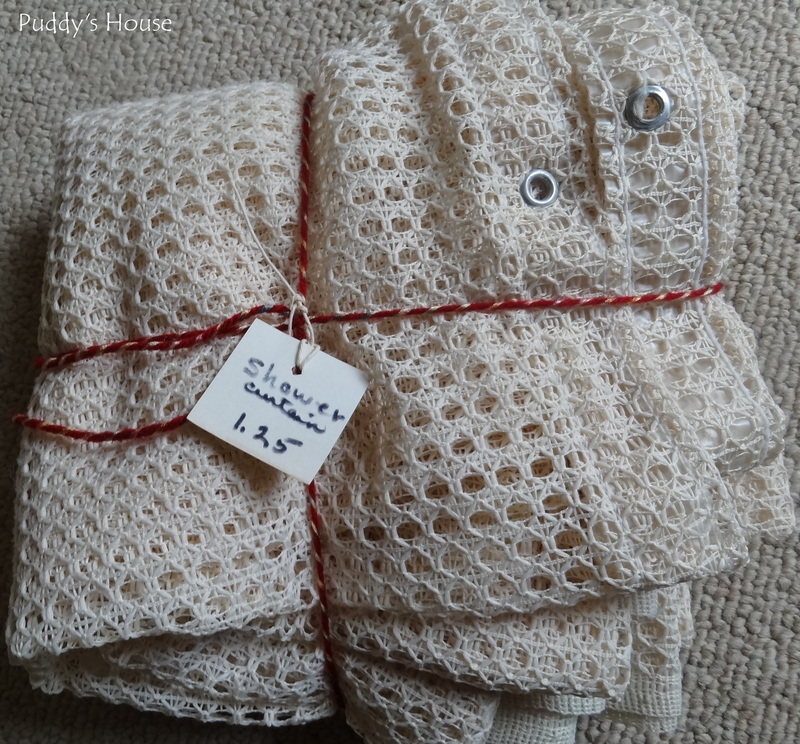 I’m looking for other ideas to use our collection.